What do you think of crows? Yes, that’s what I said… crows. You know, those rather plain-looking black birds that appear in large numbers around this time of year in Kansas. What is your impression of them? What’s that you say? You don’t think about them one way or the other? Well… I used to take them for granted, but that changed on September 30th. From there, God works with us as individuals. With me, He leads me to living lessons, usually through nature. I was out with my husband to pick up some prescriptions from the pharmacy and told him I’d wait in the truck while he ran in to get them. Not an especially exciting story so far, but stay with me. You know how it is when you’re waiting in a pharmacy parking lot. I people watched for a bit – then that got boring and my eyes were trained on a bunch of crows. They were huddled around something, which attracted my interest. The longer I observed, the clearer it was to me – it was a very large slice of bread and they were fighting over it. As two birds would start pecking at each other, a third one would try to fly away with the bread. Barely able to hold it up, the crow was unable to fly because the bread weighed it down! Forced to drop the slice of bread, the other birds would once again huddle around the prize and start fighting with each other over it. Obviously the rule was ONE SLICE OF BREAD GOES TO ONE CROW. There was no negotiation involved – it was all or nothing. Win or lose. I watched each of the birds try to sneak off with the bread, to no avail. It was too heavy to fly with, but that didn’t stop each one of them from trying. It made me think – “If you birds would just tear the bread into bite-size pieces, you could all have some!” Of course, they are birds and do not think that way. It made me think… sometimes it feels like I have so much stuff that I’m burdened by it. At one time I had things in a storage facility – which means that I was not open to getting rid of it, but not in a position to take care of it either. It’s crazy to pay to store things that you can’t even see. I’m not a hoarder. It was a time in my life when I was leaving one home to live in a smaller space temporarily. I hoped I could one day have my things around me – and I eventually did. Have you ever put the slice of bread in your mouth and it weighed you down so much you couldn’t fly??? There seem to be two extremes… folks who don’t want to share burdens because they don’t want to be a “downer” – and folks who tend to “over share”. Regardless of how much or how little folks decide to reveal about themselves, we are obliged to bear one another’s burdens – but what does that mean? Two words come to mind: sympathy and empathy. Sympathy is when you can imagine what someone is feeling or going through. Empathy is when you have been through the same circumstance and have a personal understanding of what a person is facing. Whether you sympathize or empathize, in all weaknesses, grievances and trials we are to be a friend – listen and pray with and for them. It’s not a matter of one prayer and send them on their way. Trust that God’s Holy Spirit will bring them to your mind so you can pray for them on a regular basis. This portion of Scripture refers to the custom of travelers, who, when too heavily laden with their baggage, relieve one another by bearing the burdens of the weak or fatigued. In that manner they show their good disposition toward each other; and so fulfil the law of Christ. The law of love is His new commandment and the distinguishing mark of His disciples. 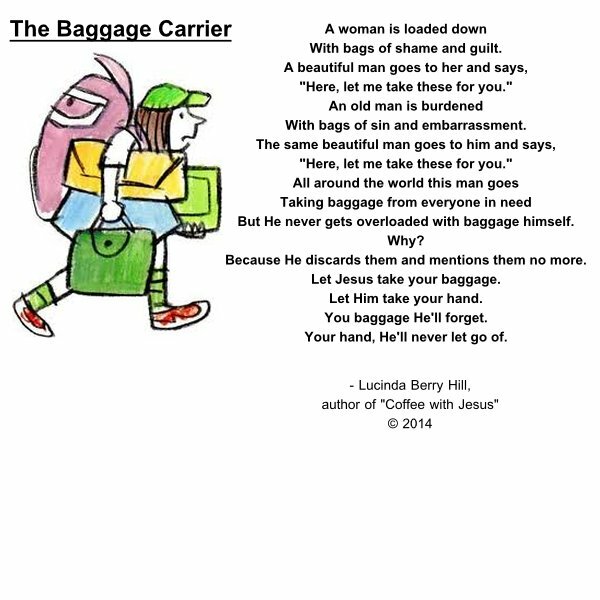 Christians know that the real baggage carrier is Christ. He’s the One who picks up the pain we feel and the suffering that follows. It’s the truth we share with each other and hope we share with the folks who do not have a relationship with Him yet. When lost folks ask me to pray for them, I’m more than happy to do that, but fast to let them know that they can know Christ too – and pray for their situation along with me. Let’s make a spiritual sandwich. The top slice of bread is God; specifically, WHO GOD IS. You think your bread is enriched? Well, this bread is the BREAD OF LIFE! Think about that – Who IS God? God’s answer was I AM. So, He is everything – literally. The bottom slice of bread is equally enriched with spiritual nutrition! This slice represents WHAT GOD WILL DO. This is where we need to exercise our faith in Him. The longer we have trusted God to take care of us, the easier it is to trust Him with all of our problems and burdens! So what is faith? We were saved by faith and our faith in God is what we come to rely on throughout our lives. This slice of bread is very important for our spiritual sandwich. What goes between these two slices of bread? Every problem, care, doubt, sin, temptation to sin needs to be there. The prayers we pray are placed there – even when you are faced with troubles, trials and temptations, ask God to give you a hunger for Him. Prayers of faith and repentance are part of the sandwich as well. Without repentance, we remain apart from God. Repent and get back on track with Him. God is a just and Holy God and cannot look upon sin. He does not adjust His standards to meet our lifestyle. Our lifestyle must adjust to meet His standards. We have butterfly bushes on the east side of our house. They were strategically planted close to our wrought iron bench. Since it was not as windy here in Kansas today, I sat outside for a while to watch the butterflies. I wondered how nice it would be to be practically weightless and able to fly. Then I realized that since God took my burdens, I feel much lighter. His benefits. Who would not want His benefits? We as a society are focused so much on losing physical weight, but I’ll bet a lot of skinny people would love to lose some spiritual, emotional and mental weight. Being heavy on the inside can be more destructive than being heavy on the outside, I believe. Nobody can hand over your baggage to God except you. Once you take that first step, you’ll be amazed how much lighter you will feel. I would use the words giddy… happy… hopeful… there is a sense of order and peace and love. Once all of the weight is gone, it’s simply amazing. There is power from God’s Holy Spirit that gives you energy like Red Bull! It’s my hope and prayer that your burdens will become butterflies today! Hand them over to Jesus and experience that weightless feeling for yourself.